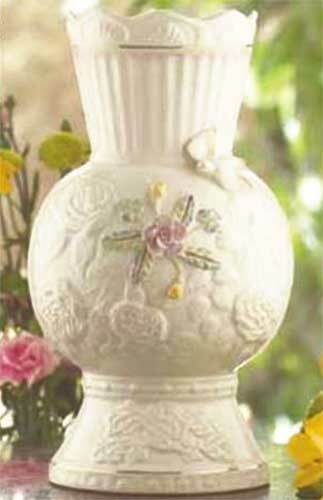 Belleek Songbird Vase is a fine china flowered design with embossed detailing along with a finch. The songbird vase is based on a piece first made in the 1860’s and it incorporates different design themes from Belleek’s 150 year history as celebrated in 2007. Each vase is signed by designer Marie McGrellis. The songbird vase features a finch songbird along with the Belleek 150th year backstamp. The Belleek vase also includes the harp, round tower and Irish wolfhound symbols along with handcrafted roses and shamrocks that includes a lucky gold shamrock. The hand painting vase includes 22 carat gold and a blush of pink accents along with both a seashell and Celtic motif. The Belleek songbird vase is a flowered sculpture with individually applied petals along with a finch. The fine china Belleek vase measures 10" tall and it includes shamrocks. The vase is handmade and hand painted in Belleek, Ireland and it is gift boxed with a shamrock history card, complements of The Irish Gift House.